Even in low doses, the plant can be toxic. Therefore, it must be used only under the guidance of a professional. For internal use, Arnica should only be taken in homeopathic doses. Prolonged use can irritate the skin causing inflamed skin conditions. If you are allergic to sunflowers, it would be best not to use arnica or products containing arnica. Arnica montana is a wildflower native to Europe and Western Asia, while the false arnica (Heterotheca inuloides) is a plant native to Mexico and the southwestern US, but used similarly as a topical ointment or liniment. Arnica is found in Europe from Scandinavia to southern parts of Europe, as well as in southern Russia and central Asia. It is also found in the Pyrenees, Siberia, Canada, and the northwestern US. This aromatic, perennial grows to about a foot high, producing downy, egg-shaped leaves and bright yellow, daisy-like flowers, which are harvested when in full bloom. The rhizomes are unearthed after the plant has died back in the fall. 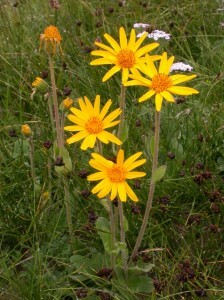 Arnica has been used extensively in European folk medicine. In his old age, Johann Wolfgang von Goethe (1749-1832), the German philosopher and poet, drank arnica tea to ease his angina. In North America, the species A. fulgens is used in place of A. montana. Arnica is a valuable external treatment for bruises and sprains as it improves the local blood supply and speeds healing. It increases the rate of absorption of internal bleeding. Generally, the plant is now taken only as a homeopathic remedy for shock, injury, or pain. Previously, it was also used in the treatment of angina and a weak or failing heart, but it is rarely used for this anymore because of the risk of toxicity.